I've lived in Japan for almost two years now. While most people think it's expensive to live here, following a relatively Japanese-style way of life helps one save money - smaller apartments means lower rent (as does living farther from the station), taking the train means savings on vehicle costs (gas, maintenance, insurance, etc), and eating Japanese food lowers my meal budget. Sure, I enjoy American food fairly frequently, but eating rice dishes makes things more manageable. However, my love of baseball has an adverse effect on my wallet. You see, Japanese souvenirs are usually more expensive. Trading cards start at 30 yen - about 30 cents - (50 yen at most stores), and the cheapest hits (plain relics of lower players) are usually 1000 yen ($10) or more. And the trinkets and other NPB merchandise can cost a pretty penny too. This is a souvenir sold in the Sapporo Dome. There are 30 different ones, and just like baseball card packs, you don't know what's inside until you open it. At 300 yen each, a full set without pulling any duplicates will set you back $90! These little pennants are about 2" square with a tiny chain to hang it on your bag or in your room. They look pretty cool, but there's no way I'd be able to afford a full set. Many smaller player-based souvenirs are sold at stadiums, such as figurines, pins and buttons, and miniature baseball helmets. And most of them cost 200-300 yen. So I generally pick one or two unique ones and see which player I get. By the way, this year for Halloween I was a Hanshin Tigers baseball player - my students said I looked like Randy Bass. I don't know about that, but my secondhand jersey ran about 2000 yen ($20) at a thrift shop, while my new cap cost around $27. The cheapest new caps go for 2000 yen or so, far more expensive than the $5 snap-back caps you can find of MLB teams at Target or WalMart in the States. Even simple, small things like erasers and keychains start at $4-5 sometimes! Of course, this carries over to other licensed merchandise as well - souvenirs for local tourist destinations, character toys and other goods carry a big premium here! At the same time, the quality of most goods is much better than what you'd find in America. Gift giving is an important part of Japanese culture - after holidays, our office is full of omiyage (souvenir foods) from our trips, and when someone takes a day off they usually bring a gift as well. We've had a lot of gifts this week just because one of our teachers is leaving. Being a bit of a cheapskate, I try to find my stuff at the elusive thrift shops or pick the lowest-priced souvenir when picking up something for myself. Have you ever spent "too much" on a souvenir? Do you collect sets of souvenirs like these? Grading services are not everyone's cup of tea - I understand this. But if you've been following the industry news, you know that Beckett Grading Services (BGS) is expanding to Asia. I don't know any collectors in Japan, though I know there are plenty of Japanese collectors who go into card shops and drop a few hundred dollars or more on the latest product looking for big hits. And there are people who like to get cards graded for various reasons. So I'm putting this out there for anyone into this - are you interested in information about the new service? If you are, let me know - I'll pass your name on. I'm not sure if being an "early adopter" will mean any kinds of discounts or anything, but since I'm going to be too busy to post anything else I thought I'd share. Just send me an email! Arigato Gozaimashita, NPB Card Guy! Somewhat recently, I received my first package in a long time from the states, sent by NPB Card Guy - you know, the one who writes the Japanese Baseball Cards blog. He had visited Japan earlier this year and we were able to get together and visit some card shops. As you know, that means we started talking about cards and want lists and stuff like that, and we've been putting together a trade for a while now. So it was really great to see the little notice in my mailbox that there was a package too big to fit, and later that day the box was delivered to my place of work (you have to love Japanese postal efficiency!). Sitting on top of the box was a Korean card complete with its original holder. I love obscure foreign cards! Mixed in with a bunch of other stuff was a single card from one of the Ted Williams sets issued in the 1990s. I have both base sets and I'm eventually going to put together an entire master set (or did I finish that? ), but I wanted another copy of the cards from the Women of Baseball subset for my Women In Sports collection. This one card finishes the (small) subset! Speaking of women of baseball, Fritsch Cards has issued a few series of their AAGPBL cards, and NPB Card Guy had series 1 and 2 box sets. A simple purchase will allow me to complete the set sometime in the next few months! Last, but not least, a bunch of cards from the 2000 Upper Deck Japan Olympic Team set filled up the box. After seeing all these cards, I have to finish the set! I don't think it will be easy, or cheap, but hopefully I'll come across a cheap unopened box or another large lot of cards. I didn't scan any of the cards because I hope to show them in complete set form in the future. Actually, I hope to show off all the AAGPBL cards as well. I would love to post a card a day. Despite the lack of images in this post, these are some of the best cards I've added to my collection this year! So thank you very much, NPB Card Guy! The Nippon-Ham Fighters got their start back in 1946 as the Senators, joining the professional leagues as the Toei Flyers the next year. They have changed hands a few times over the years, but they called Tokyo their home through the 2003 season. Several stadiums were home to the team over the years - Korakuen Stadium (home to the Giants) twice, Komazawa Stadium (rebuilt in 1962 as a football/soccer stadium for the 1964 Olympics), Meiji Jingu Stadium (current home of the Swallows), and the Tokyo Dome (current home of the Giants). However, Tokyo is packed with teams - today there are five pro teams in the metro area, including Saitama, Chiba, and Yokohama. The Fighters shared the Dome with the Giants and had always been second fiddle, plus the rent was quite high. The Fighters, owned by meat company Nippon Ham, became the Hokkaido Nippon-Ham Fighters in 2004 after moving to Sapporo. They now play in the Sapporo Dome, which opened in 2001 and was used in the 2002 FIFA World Cup. Ten years later, the Fighters still call the Dome their home, and this September it became NPB home stadium number 12 on my list, completing my stadium journey. To commemorate the Fighters' 10 year existence on the Northern Island, BBM released a 90-card pack-based set featuring (obviously) Fighters players. The base cards remind me of Sapporo Dome - it is quite grey and blue. There are two subsets, the three-card "Great Sensations" with the three most important Hokkaido Fighters players, and a 14-card highlights subset. Card 90 is a checklist with the mascots pictured on front. Backs of the regular cards use the usual base design, including partial 2013 stats for active players. The card set is identified by the [10th Season] notation on the copyright line. The lone insert set is called Face of Decade, basically a Best Nine (All-Star) team for the past decade. The backs look pretty cool; card numbers have an FD- prefix. 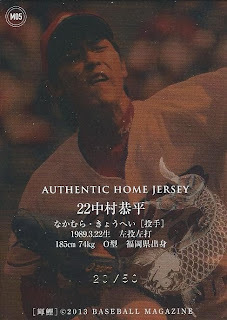 Three jersey relic cards were inserted into packs with Kaneko, Nakajima, and a Kaneko-Nakajima dual relic. I haven't seen any in person so I don't know of any parallels, though BBM's preview images show they have red facsimile signatures on the front. Of course, sticker autographs are also included in the release, with 42 players and three mascot autograph cards. Player autographs are serial numbered from 10-120 copies, and mascots have 30 copies each. BBM's lone(?) pack-based premium set came out in September, and Genesis provides the same basic big hits collectors come to expect. Opening Genesis is probably similar to busting packs or boxes of Triple Threads, Museum Collection, or Tier One, though Genesis only has active, single-player hits. The base sets this year feature a baseball seam-styled curve using gold foil, with the player's name, position, and jersey number. The typical "Engrish" writing appears below that: Honda's card above says "Hawks play for victory as a united body. The player always show the team spirit." Other teams simply replace the team name with the rest of the text remaining the same. The cards are printed on thick card stock. The backs have a few more design elements than other BBM sets, but the same basic information is provided in roughly the same layout as always. "BBM Baseball cards Premium 2013 (Genesis)" appears near the top of the base cards and on the backs of all cards in this release. Card numbers appear at the bottom; there are 108 cards in the set. A blue-foil Book Store Special Card was issued to sell through stores like Kinokuniya. The backs are the same, though cards are numbered with an RP prefix. The most-common parallel is a green-foil parallel. The backs are serial-numbered to 100. The next parallel has a red foil seam design. The red parallels are numbered to 50. The rarest parallel has a titanium foil - it's almost holographic and is much more attractive than BBM's normal silver parallels. These are serial numbered to 25. Cross Wind, BBM's cross-brand subset this year, is found in Genesis, with a total of 36 cards (3 per team). A 12-card team checklist set was also inserted into packs. This year, they don't have any photos on the front and have simple text instead. There are five insert sets in Genesis, each limited to 50 copies per card. There are 12 cards in each set. Yes, Cross Wind has a /50 parallel. I haven't seen any checklists so I don't know if it's an actual parallel or if there are different cards. Genesis is about the hits, though, and each box has a relic or autograph. Relic cards can be found in three tiers: regular edition (20-400 copies each), big version (with patches or barrels, 15-20 copies each), and super version (with large patches or knobs, 1-7 copies each). Some players don't have a regular edition (for jersey cards) or a big version (for cap relics). Rookie memorabilia cards have two tiers: regular (100 copies each) and super version (4-8 copies each). Hiroyuki Shirasaki has only one card in this set, a 1/1 bat card. Ball cards are either seam versions (50 copies each) or logo versions (10 copies each). Baseball signatures (similar to UD's Sweet Spot, but with game-used balls) are 10 or 20 copies. Finally, Cross Wind autographs are numbered to 10, 15, 19, or 20 copies each. BBM seems to have released more box sets this year than last, but I haven't really checked for sure. One of the many team box sets to be released lately focuses on the Carp stars. There are 18 regular cards in the base set, all with the same design seen above. Team colors and fish scales are very prominent in the set. Backs continue the carp design with black backs and the usual statistics and write-up. Each box set contains three random special cards. These all seem to be either relic or autograph cards. There are various versions of memorabilia and autograph cards, and I think all 18 players have relics and autographs. Despite the always high price tag on boxed sets, this might be one of the better deals, as you have a better chance at a good hit - there don't seem to be any photo cards or other non-relic/non-auto special cards in these boxes. The first relic is the basic bat (#/200) or jersey (#/180) piece. Gold leaf signature relics (#/80) appear to exist for all relic cards. 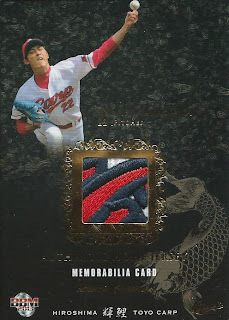 Jersey cards have patch versions (#/50), some with very nice patches! Bat cards have barrel versions (#/20). All 18 players apparently signed for the set, and there are two versions of each autograph. Vertical versions are serial numbered between 20 and 40 copies. Horizontal versions are serial numbered between 14 and 70 copies. Twelve OB (retired/legend) players have autographs in the set; they appear to be sticker autographs using the same autograph card designs, but with golden colors instead of red, white, and black. Vertical versions are serial numbered between 10 and 50 copies.